The owner of BRS uses these lights on his personal tank. Kessil produces their own Dense Matrix LED chip which gives them ultimate control over spectrum of the LED chip and the quality. They can be used with or without a controller and give a very natural metal halide shimmer. We find the A360W-E LED lights to have more than enough power for most tanks up and over 24" deep, and with the different mounting options available they are easily adaptable to your tanks lighting needs. I bought two of these lights in August 2018. One stopped working last week. 350 dollars for less than 8 months use. I do like the lights when they worked but they should at least last a few years. What a joke! I had bought 3 of these lights for my 180 gal. reef. the all lasted about 2and half years and all went a month apart from each other. I called them they said there is nothing they can do. the warranty is only for two years. I don't mind putting big money out for a good product. that will last a lot longer. After using these LEDS for 8 months I have a pretty good understanding of these LEDs. I would first like to say that they look beautiful over a tank and the shimmer effect is beautiful. They grew the small amount of Zoa's softies, LPS and low light SPS coral I have in my tank moderately. However I struggled to achieve any growth in my SPS coral. In reefing its hard to nail down a specific problem due to so many variables, but I will say that once supplemented T5 to my lights using a hybrid my SPS started growing. I can not rate it on performance , I am still doing my tank cycle. But looks wise , it’s awsome. And lights that it emits very powerful. Great light with great coloration. Easy to connect multiple lights together. Easy to set up and use. The price is set by Kessil at $350.00, so any “sale” price is nonsense. Any price over this, go to a different supplier. As far as the light goes, it provides great light even at the lowest intensity setting. It actually bleached some corals that are high light SPS. I had to acclimate them to the intensity. I have 3 of these in addition to an ATI t5 and that’s plenty of light for all my SPS. You can also adjust the spectrum from as white as you want, to the bluest light I think is possible. My corals fluoresce like crazy when I turn them all the way to blue. As far as longevity goes, I have no idea as I’ve had these for about a month. I’ve used Kessil 150s in the past and can say some have lasted from 2011 to the present, while a couple are now dead. The “shimmer” effect is one of my reasons for sticking with kessil. They put off an intense shimmer effect like you’d actually see while diving from the sun. I love them so far. So you can change MH bulbs each year. Or you can replace Kessil every other year. I unboxed 4 lights 2 of which worked great. The other two would turn on for a little bit then shut off. Due to the lack of fan noise it was obvious the lights were overheating and shutting off. I used custom mounting hardware and I ran into a pretty big design flaw due to this. The center mounting hole goes all the way to the fan. When I installed the screw I was using it went all the way down to the fan which was keeping it from rotating and causing the light to overheat. For those having issues with the fan rotation and noise make sure the hardware you are using is not touching the fan. The fans all work really well now. 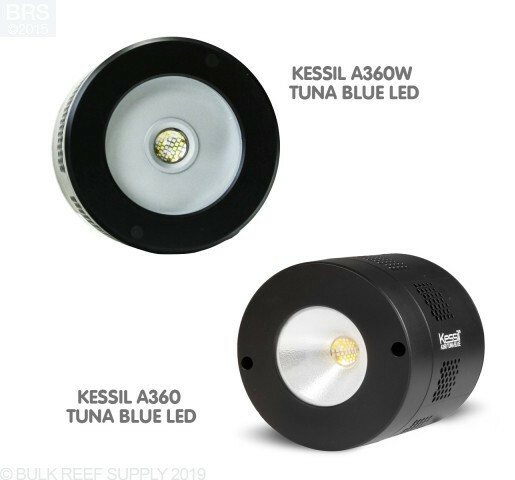 I have purchased kessil 350 and 360s over the years for my 220 gal and have never had a light last much past warranty and some have not even lasted that long. I even keep my lights clean. 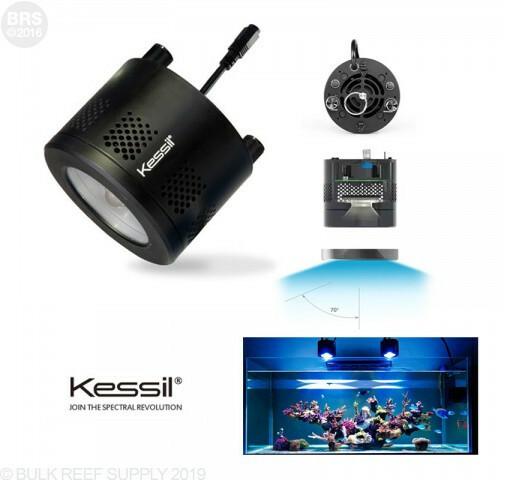 As far as I am concerned I would never purchase another product from kessil again especially with my reef tank requiring reliable lights. This is not a possibility from kessil. The A360 will ideally be over a 24" x 24" area maximum for good SPS growth. Depending on the length of your tank 3-4 of the lights would be recommended. You can use 2 and have the coverage for that tank. I would recommend using 3 if you can. Hi. I have a mixed SPS/LPS 66 gallon tank (32L x 24D x 20H)? Would I need to use the 160w or 360w? How many units would I need? 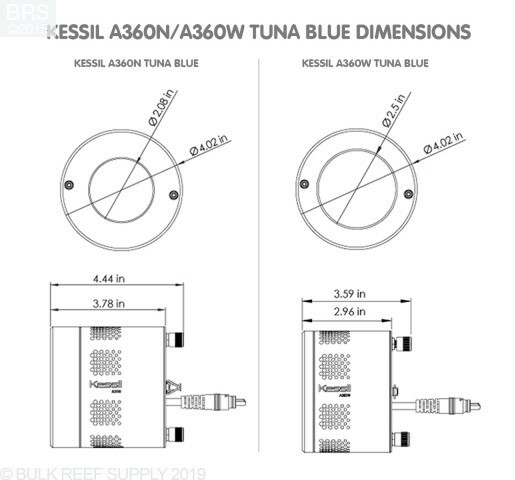 Hey there, for that size of tank and for the corals you want to keep, you will need at least two A360W for proper penetration, spread and PAR. Would this light be overkill for the Red Sea reefer nano? Would you recommend different lighting for that tank? 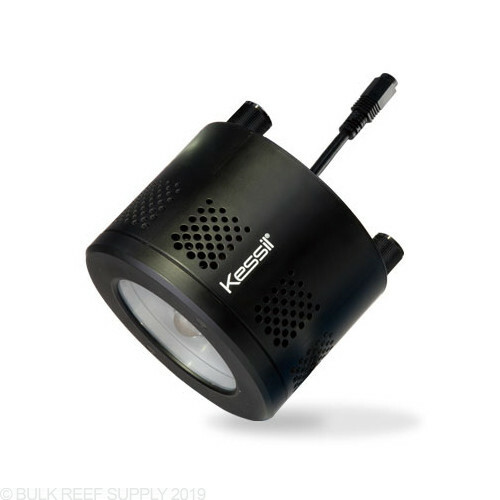 A single Kessil A360We LED will be a perfect fit for a Reefer NANO tank. 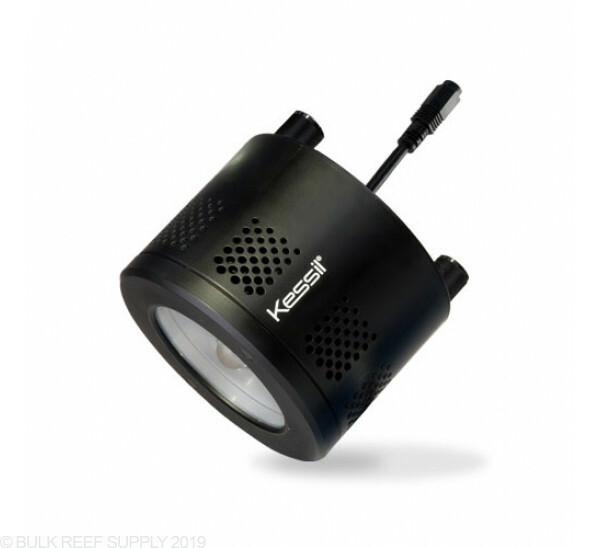 Between the ease of mounting, controlling, and the overall look and spread of the light emitted that would easily be one our top choices to light that tank when it comes to LED’s. Thanks for the question and if you have any more just let us know. I have a 5ft long tank. How many of these light will I need to grow spa corals? Should I get the narrow angle or the wide angle model? I have the Kessil A360W-E Tuna Blue LED Aquarium Light -which I purchased 6 months ago for a salt water tank. use to convert this light to fresh water? 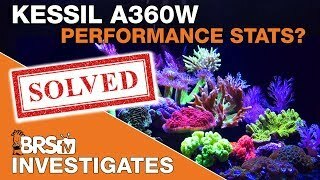 The A360 is a great fixture and should be more than capable of supporting a variety of corals in your 20g tank. A single Kessil A360 would be lacking in light on that size tank. We wouldn’t really recommend that light for any tanks wider than 24” at most. For a 32” long tank you would definitely want two of those to get full coverage and have minimal shadows. Will Kessil ever allow you to adjust the shimmer? The Kessil A360 lights can have their spectrum and intensity controlled, but the shimmer is not controllable. 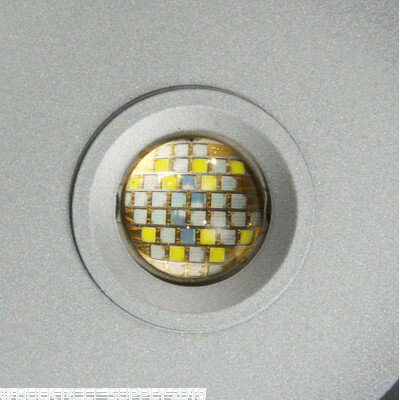 The new AP700 LED has magnetic diffusers that will lessen the effect of the shimmer, but unfortunately they are not available for the A360 lights. Some people have managed to create their own diffuser using different intensities of semi-translucent clear plastics and then getting creative on attaching them to the light. On a 72'' 120 gallon tank would it be better to run 3 wide angle or 4 narrow angle lights? I would recommend going with 3 of the wide angles! Do these have a low intensity setting to replicate moon light in the evening? 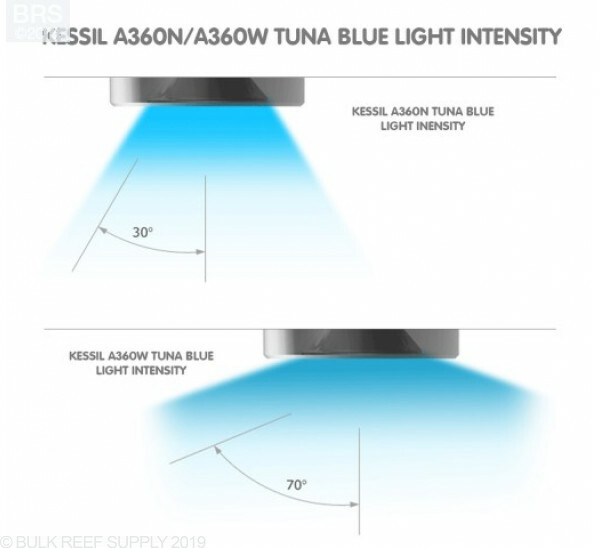 Currently the Kessils have a limited range on the intensity, and while they can get fairly blue, they don't quite hit the same actinic-only spectrum that most people expect in a dedicated moonlight. For this reason, most people wanting moonlight effects end up adding on a small dedicated accent LED. 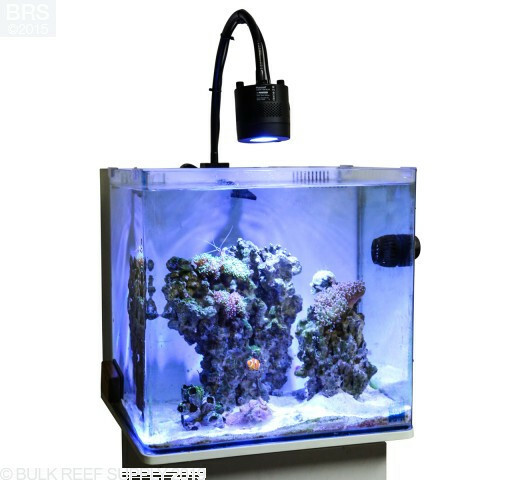 34 db reef ready tank size 36x18x12 would this light work?? The A360 will do very nicely, however I would go with a pair to light a tank of this size. For that price range, you may find a single AP700 to be a good option. On its whitest setting, yes, you can grow chaeto, but the growth rate will not compare to what the H380 or even an H80 could produce. having the correct spectrum to grow algae we have found is very important, and having the correct spectrum will make algae grow much quicker and healthier. I was wondering if you would recommend a160 or a360 for a 72"x24"x24" 180 gallon and how many. Or is there another light that you would recommend. We recommend 3 of the Kessil A360's for best performance. Feel free to let us know if you have any further questions! 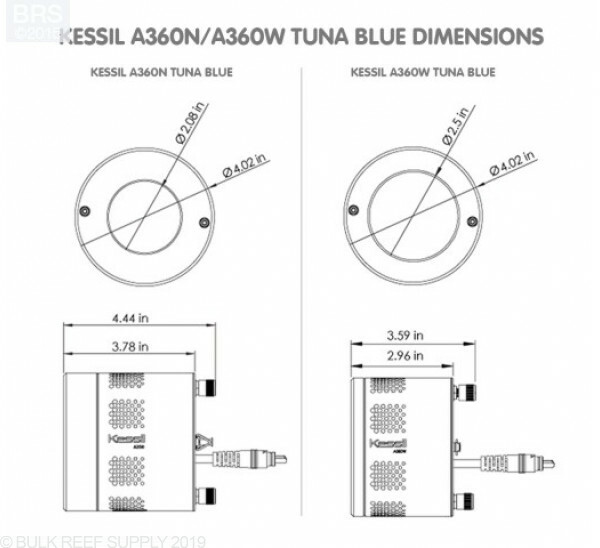 How many A 360W-E Tuna Blue LEDs do I need for a fusion 50 IM tank? Thinking about buying this lighting scheme, how many for a 180g tank (want to keep SPS) 72"x24"x24"
For a 180g tank we would suggest starting out with 3 Kessel A360We units and once the corals start to grow out a bit more, you may find that you need more lighting to cover up the shadows that the coral growth has created. 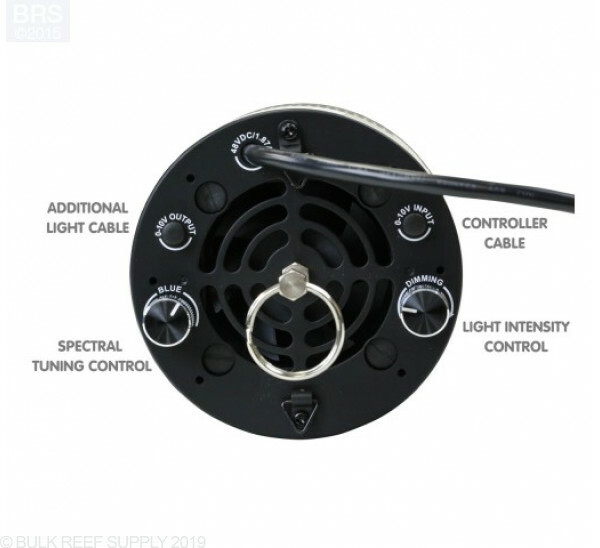 We would suggest looking into adding a couple T5 lamps to help even out the coverage in an SPS dominant tank since 5x A360 units can get pretty expensive. Will the 360 provide enough light to support RBTAs? In most cases, the A360 lights will be perfectly suitable for RBTA growth. They will probably have more power than you actually need to use too. Hello I have the innovative marine nuvo 40 and was thinking of this light for my tank. Softies and lps would it work well with good coverage?